The 27th European Meeting of Cultural Journals took place in Gdańsk from 4 to 6 November 2016. The meeting was organized jointly by the European network of cultural journals, Eurozine, the Institute for Human Sciences in Vienna, the European Solidarity Centre in Gdańsk and Res Publica Foundation, in partnership with Erste Foundation and the Mayor of Gdańsk. More than 100 editors and intellectuals from Europe’s leading cultural journals participated in the event. In recent years, issues of solidarity have dominated political debates on both sides of the Atlantic. In the aftermath of the 2008 financial crisis, questions of inequality and solidarity have become intertwined – especially in countries that have implemented severe austerity measures. Over the past year, however, questions of both national and international solidarity have also been central in connection to the treatment of refugees and migrants. These ‘crises’ have led to polarization, but also to an increase in grass-roots mobilization to express discontent with national governments and/or EU policies, as well as to create alternative forms of community support within European societies and beyond. In many of these debates, the commons have emerged as an alternative to privatization by market forces and state protectionism. The Commons in Audio-Visual Culture A series of videos curated by Charlie Tims (Doc Next Network) will be screened during the breaks. Some of the videos have their origin in challenges and media labs initiated by the Doc Next, others have been identified by Doc Next’s ‘observatory’, which monitors all forms of media activism across Europe. The screening is made possible by the European Cultural Foundation. Come and play this thought-provoking board game in the breaks! The game is a reference to Monopoly, that was turned upside down during the Hackcamp of the 17th ZEMOS98 festival in 2015 and several other events. The idea of Commonspoly is playing to get to a general state of welfare for all of the participants; to redistribute the goods in order to commonize them; to share the access to material and immaterial resources for the purpose of building a common world. Bringing the Commonspoly facilitators and the game to the Eurozine conference is made possible by the European Cultural Foundation. Gdańsk is Poland’s principal seaport and the centre of the country’s fourth-largest metropolitan area. The city lies on the southern edge of Gdańsk Bay (of the Baltic Sea), in a conurbation with the city of Gdynia, spa town of Sopot, and suburban communities, which together form a metropolitan area called the Tricity (Trójmiasto), with a population approaching 1.4 million. Gdańsk itself has a population of 460,427 (December 2012), making it the largest city in the Pomerania region of Northern Poland. Gdańsk was the birthplace of the Solidarity movement, formed in 1980, which played a major role in bringing an end to Communist rule in Poland and helped precipitate the collapse of the Eastern Bloc, the fall of the Berlin Wall and the dissolution of the Soviet Union. 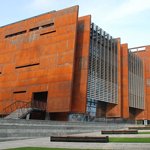 The conference took place at the European Solidarity Centre, located on the territory of the Gdańsk Shipyard in the centre of the city. It serves a museum and library and is devoted to the history of Solidarity, the Polish trade union and civil resistance movement, and other opposition movements of Communist Eastern Europe. The design of the building, by the Polish FORT Architects, was the winner of an international competition held in 2007. The walls evoke the hulls of ships built at Gdańsk Shipyard. It opened on 31 August 2014.